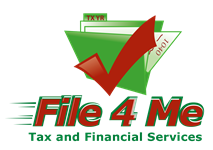 Let File 4 Me prepare and electronically file your federal and state income taxes securely and with accuracy. Free Electronic Filing - At File 4 Me, we never charge for electronic filing. When you allow us to electronically file your return to the IRS, you can be assured that the IRS will get your return on time. Paper Returns - If you prefer the traditions approach, we can prepare a standard paper return and the 1040 to the IRS. Refund Transfers (RT) - Pay no money out of pocket. We will take our fees out of your refund check. When you file your tax return electronically, your federal refund will arrive within 10-21 days.